If you’re a graphic designer,you must have heard of postscript format file before.But what is postscript on earth? Postscript,also called PS,is a kind of programming language which describes the appearance of a printed page. Postscript was developed by John Warnock and Charles Geschke in 1982 and has become an industry standard for printing and imaging. It is best known for its use as a page description language in the electronic and desktop publishing areas. 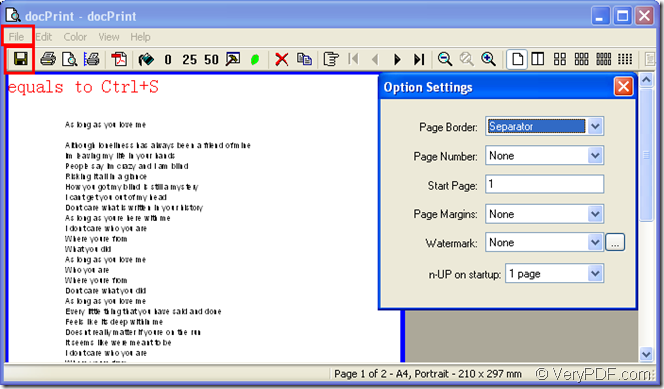 All major printer manufacturers make printers that contain or can be loaded with Postscript software, which also runs on all major operating system platforms. A Postscript file can be identified with the extension name of .ps.Postscript has been used by print service providers, publishers, corporations, and government agencies around the world. Which software can be used to convert word to postscript? Maybe someday you will receive a task which requests you to convert word to postscript file format.Maybe it is a task that you have never done before and you want to know which software can be used as a tool.Don’t worry,docPrint Pro will do you a great favor. 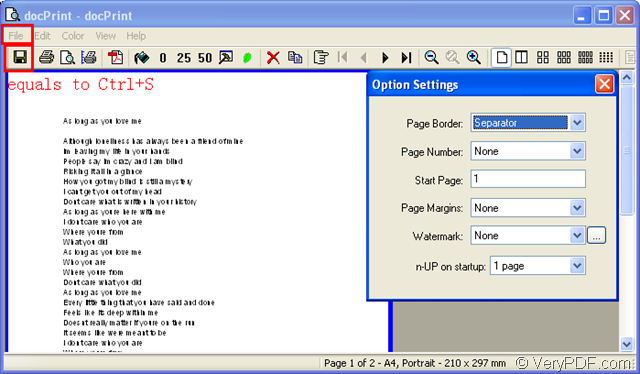 docPrint Pro is a Windows printer driver that saves ink, paper and time by controlling printed output, it supports print 2, 4, 6, 8 or 16 pages on a single sheet of paper, it also supports scale A0, A1, A2, A3 papers to standard Letter or A4 paper sizes.docPrint Pro is also a Document Converter, it converts any printable document to 50+ graphics, it may be a Microsoft Word file, Adobe PDF file, HTML file, Excel file and others, docPrint Pro supports various image formats, resolutions and compressions.You may ask is it easy to access?In essence,docPrint Pro is easy-to-use, just print a document to "docPrint", you will be able to start using Document Printer software. 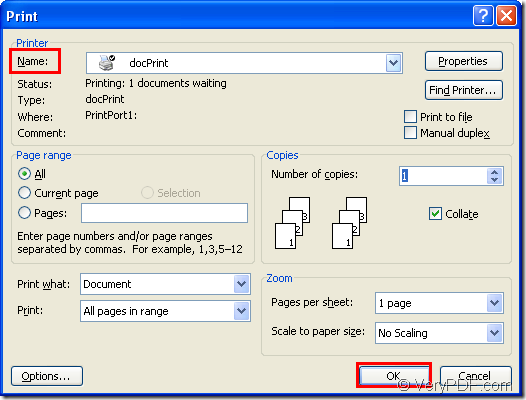 How to convert word to postscript with docPrint Pro? Please open the word document in your computer first and click “File”—“Print” to run the printer driver in your computer.You can also take the quick way—pressing “Ctrl”+ “P” on your keyboard at the same time.All these two ways can pop up a “Print” dialog box in which you can choose your printer.Please see Figure1. 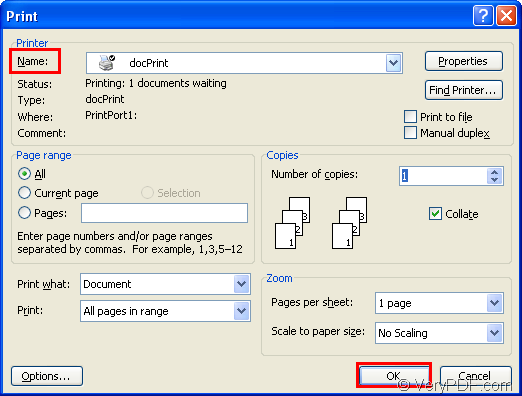 After choosing docPrint as your current printer in “Name” combo box,you should click “OK” button to pop up “docPrint” dialog box in which you can do all the things you want,such as converting word to postscript.Please see Figure2. 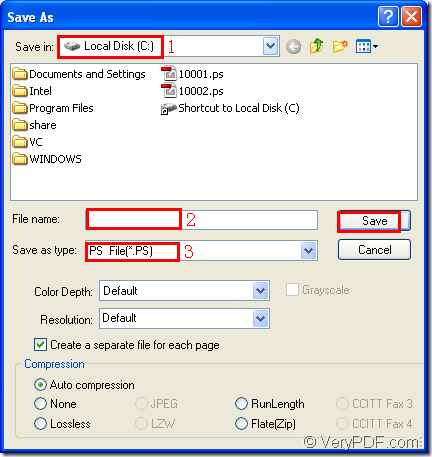 You will find there are many icons on the toolbar to control many kinds of functions.But if you want to convert word to postscript without setting any parameters,you can ignore the toolbar and click “File”—“Save As” directly.You can also click the icon framed in the rectangle below “File” to pop up “Save As” dialog box showed in Fiugre3.Of course,the hot key “Ctrl”+ “S” will also aim at the same goal. 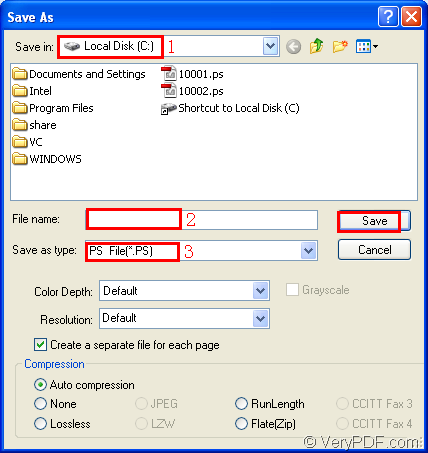 In “Save As” dialog box,you can specify the path for the target file in “Save in” combo box,please see rectangle1;edit a suitable name for the target file in “File name” edit box,please see rectangle2;ensure the type of the target file in “Save as type” combo box,please see rectangle 3.You should choose “PS File(*.PS)”here as we have mentioned that .PS is the suffix of postscript format file.Then you can click “Save” button. In no more than 10 seconds,the conversion of word to postscript will be over and you can find your target file in specified location to complete your task. How to convert files of AutoCAD to jpc? This entry was posted in docPrint Pro and tagged Word to Postscript. Bookmark the permalink.